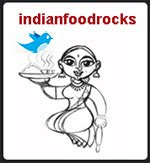 Indian Food Rocks: Raji, I will miss you. I had the good fortune to meet Raji and spend time with her on my trip to India in Dec 2010-Jan 2011. Anita and Raji cooked for me, making me feel very special. Raji came bearing her now famous brinji, an unbelievably flavorful sambar and a Christmas cake. I was jet-lagged and did not entirely comprehend how someone so vivacious and full of life could be sick. She had a rare congenital digestive condition, she told me, and was possibly looking at undergoing yet another surgery a few months down the road. I looked forward to meeting her again a week later but by then the pollution had already started taking its toll on me and we were trying to do too much in the few hours we had in Delhi. There was going to be a next time, we promised each other. A picnic, even. Just before her surgery last year, Raji sent me passwords to her blog and her email account, asking if I would moderate the comments on her blog and if her recovery took longer than expected, to publish a few posts she had in Drafts. I was honored and overwhelmed at the same time. It was like a key to her thoughts. I moderated the comments that came through and prayed that that would be the extent of anything I would have to do. I wrote her long emails and she always wrote back, no matter what. Within a couple of months, she was home and I was only too happy to hand back the reigns to her blog. It was difficult but she was not one to wallow in sympathy or self-pity. She also wasn't planning on giving up. I didn't want her to give up either so I asked my neurologist brother-in-law who was transitioning from Columbia to Mt. Sinai if he could reach into his network for information, new developments, anything. He spent a fair amount of time explaining, only because I was unwilling to hear what he was saying, that she was getting the complete picture from her doctors. It was even harder to tell her that. Raji fought it the best way she knew. True to her nature, she donned a cloak of bright upbeat spirits and faced each day with a positive outlook, for her young daughter and her husband. Thanks for your support and I'm glad I met you when I did! she wrote in her last email to me. Me, too, sweet Raji. Me, too. I will miss your sharp wit, your lovely smile and the underlying mischief in your words. I loved being irreverent and flippant together with you. It made for some full-belly laughs without being disrespectful or mean. I will miss that the most. Rest in Peace, my lovely friend. And, one way or another, we'll find a way to picnic together. Thank you for this beautiful tribute, Manisha. That's a gorgeous picture of a wonderful person- I will miss her so. Such a touching post Manisha, after reading your post I think you are so lucky to have personally met such a wonderful courageous person. Even though I don't know her personally .. reading thru your post literally I can feel how lovely person she is. Let her soul rest in peace. My prayers to her family too. RIP Raji Shankar ! I dont know her , but from your words , I understand what a strong person she was and truly an inspiration for a lot of people who think the trivial obstacles are the toughest and wallow in self pity. Hugs to you Manisha! A touching post M. I know how difficult it is for you as well. I hope her daughter is coping up well. I mean it will be so hard for that little girl for sure. I have no words to express what a loss and pain it is to their family. RIP Raji!I don't know her personally but have visited her blog sometime back. A very touching post Manisha. You were lucky to have met her in person. So hard to digest this news. She used to comment on my posts. But then, I think I was too busy in my own world, so I never got to know her. Will pray for her soul and her family. What a lovely tribute. I am sorry for your loss. I am SO sorry :( I didn't know her or her blog.. wish I knew! She is so beautiful with such a lovely smile. Thanks for sharing Manisha. I understand how it feels especially when you have met someone after knowing them long thru their blogs. I knew her as Miri and only after your posts on the India visit did I have a face to put against the profile and got to know her name. So many bloggers have written tributes to this beautiful person and am reading all of them. So sorry for the loss of your lovely friend. Nothing prepares us for this. I hope your happy memories will be a comfort. what a lovely person she was! we will miss her! prayers for you and her family! That's a touching tribute Manisha...She was a wonderful person, I just cant believe it has happened, she's been a very close friend for so many years now.. I can't stop looking at her beautiful smile. This post has me in tears! I keep going back to that wonderful afternoon we spent together. She was a brave girl indeed. What courage in such adversity. We'd hoped to meet one time or the other. It never happened. I've been thinking of her all of yesterday and with your post I know I'll think of her with more awareness of the courageous person she was. You were lucky to have known each other. Your tribute is moving. Will miss her too. Never had the chance to know this lovely lady. But the comments by her friends have placed her in my thoughts since yesterday. Your tribute made me cry not just for her, but for her young child, and for all the lives she touched. My sincere prayers. A virtual hug for you , my new found friend. Manisha, I know Raji from Kalyan's, Bongmom's and your posts...that's it. I wish I had interacted with her..she has such a lovely smiling face....positive vibes all around her!! Very beautiful tribute here. May God give all her family members and friends the strength. Sincere & heartfelt condolences to the family & friends of Raji. She looks very bubby, mischievous, and a very sweet person..it's really sad ! You are so lucky to have known such a beautiful soul in close quarters Manisha. I had tears rolling as I read your post. Kudos to her fighting spirit and May she rest in peace. She will surely be missed by many like us. This is what I keep reading about her and I miss not knowing her, but I am glad I got in touch with her. It's a warm, beautiful tribute, Manisha. Thanks Manisha. That was a beautiful tribute. I've visited her blog many times. Liked her simple style of writing and love for great food. Nice tribute Manisha. Rest in peace Raji! Thanks for this post Manisha. I got to know her through your posts and will miss her. A very beautiful tribute to a dear friend, Manisha. God bless her soul & take care of her family ...my condolences to you & family as well. Sorry to hear about your friend. Hugs! dear Manisha, my thoughts are with you , and i will add Raji to my daily prayers. a wonderful tribute by you. i was aware of Raji through your website,but not of the serious situation. i have 5 daughters, and 2 step-daughters , so keenly feel the loss of a lovely young woman ! rest in peace, Raji . Very Sad.. may God bless her soul rest in peace. Veyr touching post !! Let her soul RIP !! I don't know her or blog, but is really tragic to loose the life at young age. Extremely saddened to hear of this. It's a lovely and very fitting tribute Manisha. She was always so gracious. Stay strong. This is so shocking! I interacted with her just once. But I could feel all those qualities you've mentioned here, in those 2-3 lines she wrote to me, a complete stranger to her. How unfortunate! May God give strength and courage to you and all her loved ones to face this huge loss! Rest in Peace Miri! I am sorry, as I read your blog , my throat is tight. I did not know about Miri, but since this morning I am learning about this super person. those of you who knew her were blessed. Such positive feelings in a person is amazing She seems to have touched all who knew her with warmth. Thanks for sharing it with readers. It is comforting ot know such people walk the world and make otehers lfie enriched. so sad to read about Raji! Though I've never had the chance to meet her, she sounds like such a warm, friendly, happy person. Just reading this today. Sorry for my delay in conveying my condolences to you on the passing of your dear friend. Thank you all very much for your condolences and your beautiful sentiments for Raji. Please hold her in your thoughts so that we can continue to be inspired by her. Please also include her family in your prayers. This is very very sad. I didn't know her , but through your's and other bloggers' posts- it is apparent what a lovely, generous and joyous person Raji was. I have been reading some of her older posts and the account of her visit with you and Anita and she seems so sweet and the thought of the loss of such a young wonderful person is very difficult to comprehend/bear. Praying for her husband, daughter and family..and huge hugs to you. Thanks for this post Manisha. I didn't know Raji, but I cannot imagine the pain her family must be going through. I came to your blog looking for recipes and ideas on different cuisines but I have to comment on this post of yours. Sometimes our beloved persons leave us and you have to let it go. I wish Raji that wherever she goes, she lives peacefully and happily. May she is blessed with divinity and God showers his best on her. It is through your blog that I got to know her and I extend my condolences to her family and hope they have the courage to deal with such a huge loss. Such a heart breaking news, let her soul rest in peace. I can see how wonderful your friendship was manisha. Hope miri's family gets to cope with this huge loss. Manisha, Thank you for this wonderful tribute. This is my first time commenting on your blog and I had previously found Miri's blog through Anita's blog and yours. I thought her blog sounded wonderful and loved the way she wrote. Am completely shocked to realize she has passed away. God bless and help the family through this trauma. I don't know what to say, I'm really sorry to hear ur loss. I don't know her personally and I reached out her blog for the first time now. She look gorgeous n hard to believe someone whoz so talented n young had passed away. May almighty give courage n strength to her little daughter, family n friends. May her soul rest in peace..
We miss your kind heart.